U.S. 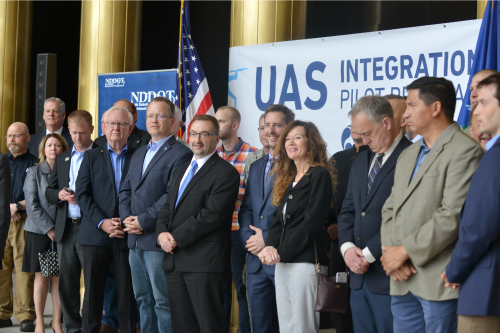 DOT has announced that the NDDOT has been selected as one of 10 participants in the Unmanned Aircraft Systems (UAS) Integration Pilot Program, an initiative aimed at shaping the future of drones in America. “We are looking forward to helping today’s winners unlock the enormous potential of drone operations, which will create new services and jobs in their local communities,” Secretary Chao said. The three-year Drone Integration Pilot Program will enable agencies to work on policy that can safely advance UAS operations, including beyond visual line of sight, flights over people and night operations. As the lead applicant and program manager in North Dakota, the NDDOT will work with partners and stakeholders from across the state including the Northern Plains UAS Test Site in Grand Forks and city, state and tribal agencies. “Today’s announcement further cements North Dakota’s position as a national leader in transportation and UAS advancement,” Gov. Doug Burgum said. Identifying ways to balance local and national interests related to UAS integration Improving communications with local, state and tribal jurisdictions Addressing security and privacy risks Accelerating the approval of operations that currently require special authorizations. The Program is expected foster a meaningful dialogue on the balance between local and national interests related to UAS integration, and provide actionable information to the USDOT on expanded and universal integration of UAS into the National Airspace System. The proposal includes a wide variety of diverse operations that incorporate advanced technologies that seek to expand UAS operations at night and Beyond Visual Line of Sight. The proposal will focus on data from four criteria: external systems, aircraft system technologies, training requirements, and processes and procedures. Operations will be in multiple types of airspaces ranging from rural to urban areas. Working with experienced UAS research partners will lead to scalable operations for a multitude of UAS industries including linear infrastructure inspections, crop health monitoring, and media reporting and emergency response. The proposal focuses on agricultural, public safety and infrastructure inspections, with planned Beyond Visual Line of Sight (BVLOS) operations over people and nighttime operations. The proposal highlights plans to invest in mobile ground-based detect and avoid radars and advanced weather infrastructure. The awardee, along with partners CNN and the Green Valley Farms Living Laboratory, has an aggressive 90-day schedule for high-profile Extended Visual Line of Sight (EVLOS) and night operations. The data obtained from these operations will be broadly applicable, and could extend to a wide range of operations and geographical locations. The awardee will conduct UAS operations and examine new technologies not in use today by leveraging its indoor testing facilities and various drone landing stations and ports. The proposal would employ a variety of available communications technologies, including 5G test networks and the 4G LTE cellular network and AT&T's national first responder network authority (FirstNet.) These UAS operations will provide solid data to improve UAS specific ID & Tracking systems, necessary for UAS integration into the National Airspace System. The proposal seeks to facilitate package delivery in rural and urban settings. Its includes the use of enabling technologies such as detect and avoid, Identification and tracking, radar systems, and mapping tools. The awardee seeks to leverage existing expertise through partnerships with the Virginia Tech UAS Test Site, NASA, and stakeholders with cyber security expertise. Data obtained through these diverse operations and varied operating environments will provide significant, scalable benefits to the agency and industry. The proposal deploys UAS to support beyond visual line of sight (BVLOS) operations in rural communities. It seeks to leverage a statewide unmanned traffic management system to facilitate precision agriculture operations. Operations will use a range of technologies, such as detect and avoid, ADS-B, satellite communications and geo-fencing. The program will use existing in-state resources such as fiber optic networks and UAS Traffic Management (UTM). The awardee has a robust community involvement plan that supports the diverse operations that are planned. The proposal focuses on low-altitude aerial applications to control/surveil the mosquito population using a 1500-lb. UAS. The proposal includes scalable solutions that take into account a broad range of current and future technologies that include ground-based detect and avoid radar systems that would integrate ADS-B, infrared imaging and satellite technology. The proposal includes night operations, BVLOS and operations over people. The proposal focuses on the inspection of FedEx aircraft and autonomous operations that support airport operations such as perimeter security surveillance and package delivery. Proposed operations include working with a UTM concept that would also work with manned air traffic. Teaming with FedEx and Agricenter International, the awardee would support an integrated environment of urban, airport, private property and farmland that would yield an estimated $500 million annual benefit to the economy. Data collected would not only serve UAS, but work with normal air traffic truly advancing integration. The proposal seeks to test localized package delivery within a defined airspace by establishing drone delivery stations in local communities. This approach enables small businesses to utilize this delivery platform for commercial purposes. The proposal seeks to operate over human beings, beyond visual line of sight and at night, and seeks to use a variety of technological tools to enable these advanced operations. Tools include ADS-B, detect and avoid technologies, UTM and radar technologies. The data collected from these diverse operations will significantly enhance safe UAS integration into the National Airspace System. The proposal focuses on the time-sensitive delivery of life-saving medical equipment, such as medical defibrillators in emergency situations in both urban and rural environments. The awardee will integrate additional infrastructure such as radar and weather data in order to expand the UAS capability so it could save up to 28-34 lives per year, using one drone in a three-mile city radius. This proposal considers a nationwide scalable model for medical delivery operations and has several commercial medical partners. The proposal's primary focus is pipeline inspection and surveying in remote areas and harsh climatic conditions, but it has proposed a broad range of other types of operations in urban and rural areas, ranging from public safety to UAS detection. The awardee uses enabling technologies that include collision avoidance, detect and avoid day and night, ADS-B, differential GPS, satellite services, infrared imaging and UTM. Operations in remote areas provide a unique opportunity to evaluate data on several advanced technologies. The unique climate and operating environment also provide an opportunity not available to other awardees. Grand Forks Regional Economic Dev. 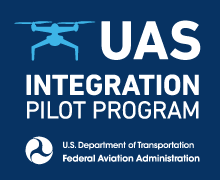 Policies and regulations relating to the UAS Integration Pilot Program. The North Dakota Department of Transportation (NDDOT), established in 1917, is an innovative and progressive organization with the mission to safely move people and goods. NDDOT strives to build and maintain an efficient transportation system of more than 8,518 miles of roadway and 4,858 bridges. 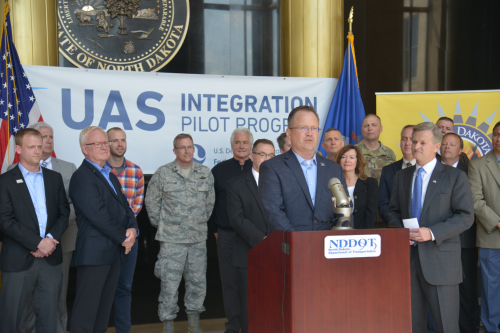 Innovation and integration of the UAS pilot program is key in expanding NDDOT’s future vision for traffic safety, autonomous technology and partnerships. For more information visit: https://www.dot.nd.gov. The Northern Plains UAS Test Site (NPUASTS) is one of seven Federal Aviation Administration UAS test sites in the nation. 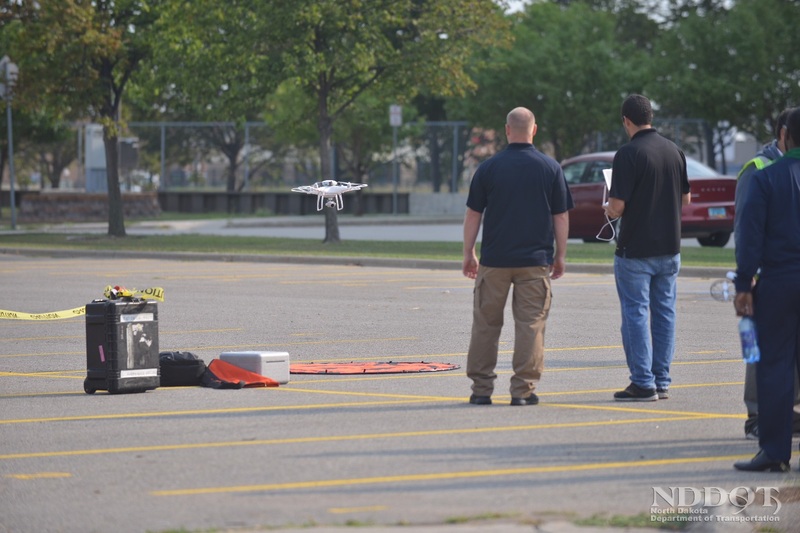 The mission of the test site is to collaborate with FAA and industry partners to develop, systems, rules and procedures to safely integrate unmanned aircraft into the National Airspace System without negatively impacting existing general or commercial aviation. For more information, visit: http://www.npuasts.com/. Botlink was founded in Fargo, N.D. by military pilots and engineers with the intent to safely share the benefits of drones. Botlink is a cloud-based operations platform that links drones to industry in real time. The platform allows users to capture, process and deliver aerial imagery. Botlink also provides automated drone control and safety features allowing operators to remain safe and compliant with complex flight regulations. For more information visit: https://botlink.com/. Cable News Network (CNN) is a global news channel and a subsidiary of AT&T's WarnerMedia. CNN was founded in 1980 as a 24-hour cable news channel. Upon its launch, CNN was the first television channel to provide 24-hour news coverage, and was the first all-news television channel in the United States. For more information visit: https://www.cnn.com/. Russ Buchholz has been named UAS (Unmanned Aircraft Systems) Integration Program Administrator for the NDDOT. 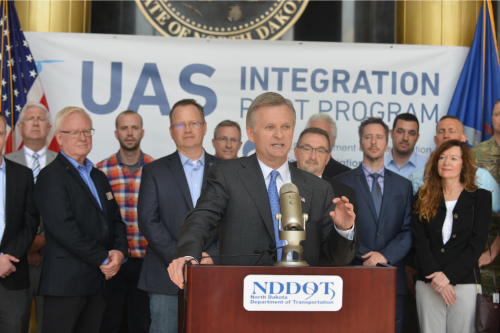 The NDDOT has been selected as one of 10 participants in the UAS Integration Pilot Program through the US DOT. Since NDDOT is the lead applicant, the program administrator will work with partners and stakeholders from across the state including the Northern Plains UAS Test Site in Grand Forks and city, state and tribal agencies. At this time, Russ will continue to serve as the DOT’s ITD Division Director. Russ has been with the NDDOT for 10 years, previously serving 26 years in the National Guard, retiring at the rank of Lieutenant Colonel.